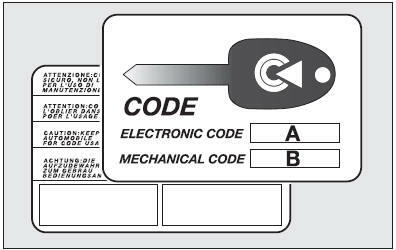 the mechanical key code (B) to be given to the Fiat Dealership when ordering duplicate keys. Make sure you have the electronic code (A) with you at all times in the event you have to perform an emergency start-up. IMPORTANT In order to ensure perfect efficiency of the electronic devices contained inside the keys, they should never be exposed to direct sunlight. U.K. VEHICLES ONLY At the behest of the motor Insurance Companies the CODE card for emergency starting and remplacement of keys is not provided. If you need assistance please contact your nearest Fiat Dealership or telephone Free Phone 0800 717000. CODE card must be handed over to the new owner when selling the car.